Despite the mild weather, our local businesses are gearing up for a great season of shopping local. 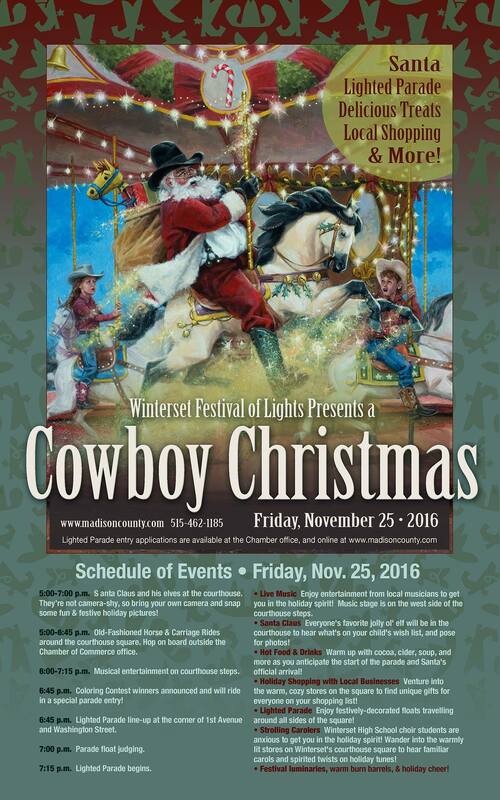 Black Friday is just a week away, with Santa arriving in the Festival of Lights parade that night, and the next day’s Small Business Saturday will offer lots of specials and festivities around the square. More on that in a moment, but first, here are some events happening this weekend. 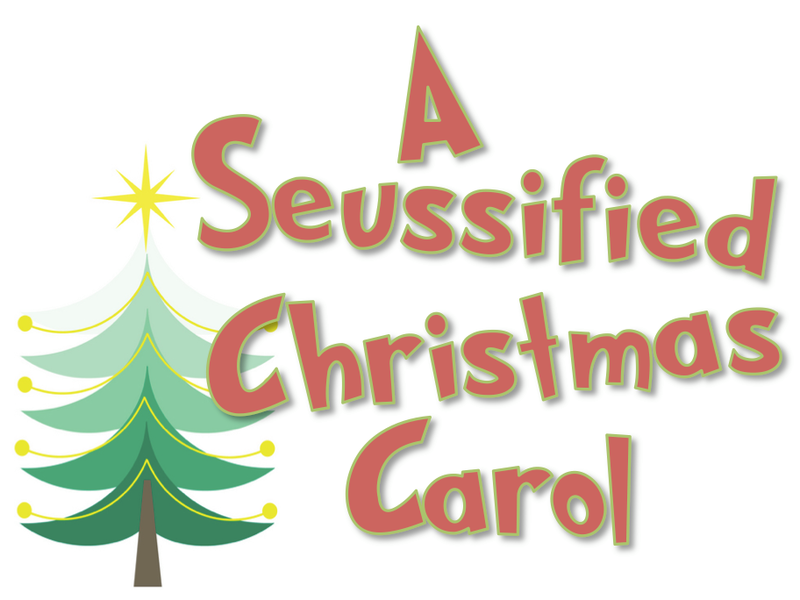 Angel Wings & CT is hosting their annual Christmas Open House today (until 7:00 p.m.) through Saturday, November 19th. Friday and Saturday hours are 9:00 am to 5:00 pm. 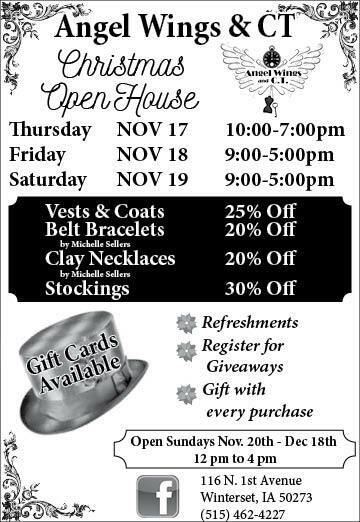 They will be offering in-store specials such as 25% off vests and coats, 20% off belt bracelets by Michelle Sellers, 20% off clay necklaces by Michelle Sellers, and 30% off stockings. They will also be serving refreshments, with sign-ups for giveaways and a gift with every purchase. 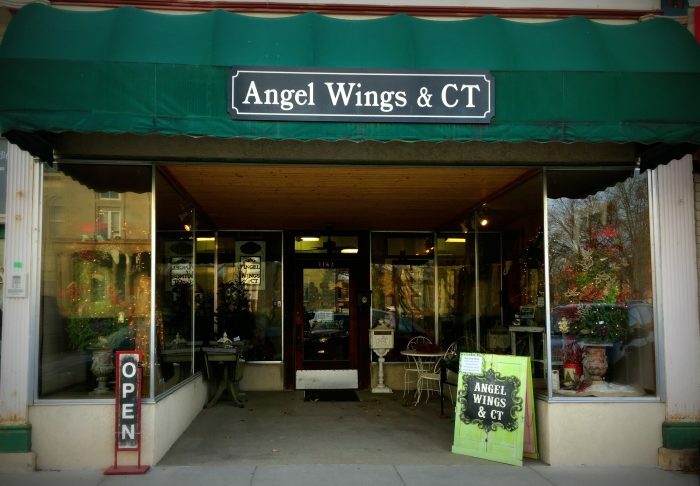 Starting November 20th (through December 18th) Angel Wings & CT will be open on Sundays from 12:00-4:00 pm. While you’re shopping, fill out your own wish list for Santa and they’ll keep it on hand at the register. Then they can direct Santa to the goodies you like! Gift cards are also a great option. 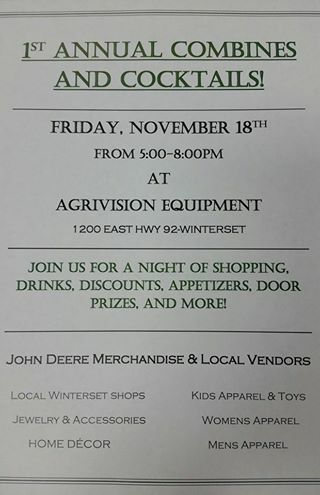 Stop by the first ever “Combines and Cocktails” event hosted by AgriVision Equipment Group on Friday, November 18 from 5:00-8:00 pm at 1200 E. Highway 92 in Winterset. You can enjoy an evening of shopping, drinks, discounts, appetizers, door prizes and more. Covered Bridges Winery will be serving wine samples. You’ll find everything from children’s apparel and toys to men’s and women’s apparel and home decor. The annual church craft bazaar known as the Holiday Hop is this Saturday, November 19th from 8:30 am to 1:30 pm at the locations listed below. 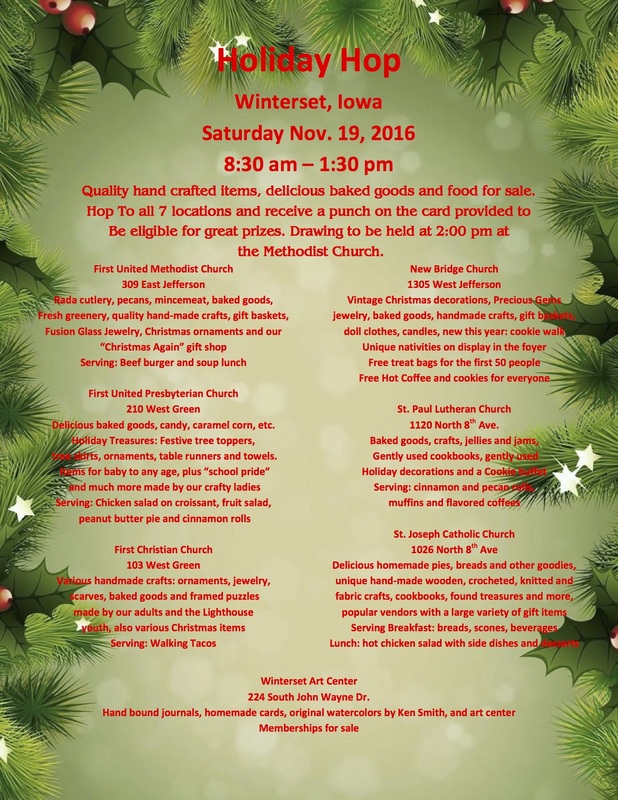 Additionally, there will be a Stop and Shop Craft Fair on the same day at the VFW in Winterset (behind the library) from 9:00 am to 2:00 pm. While you’re out and about, 1st Avenue Collective in the old Madison County Jail invites you to help them celebrate their first anniversary of business in Winterset! 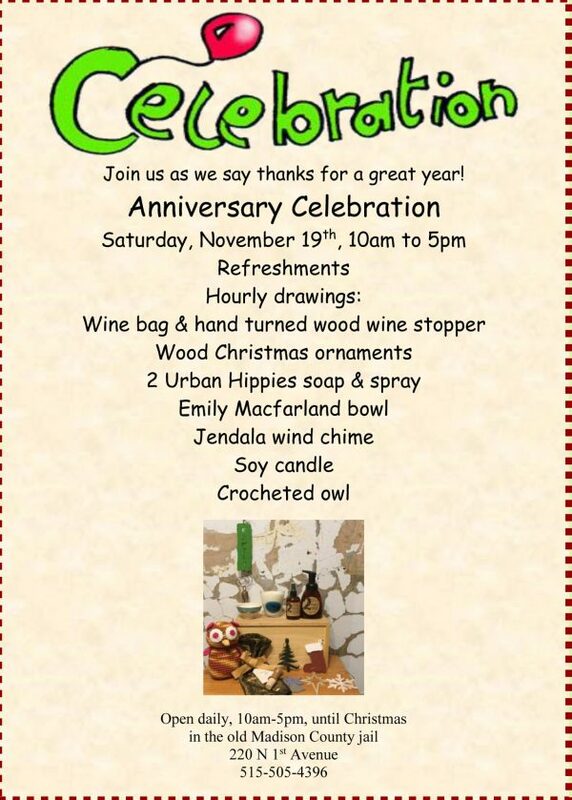 Stop by Saturday from 10:00 am to 5:00 pm for refreshments and hourly drawings. 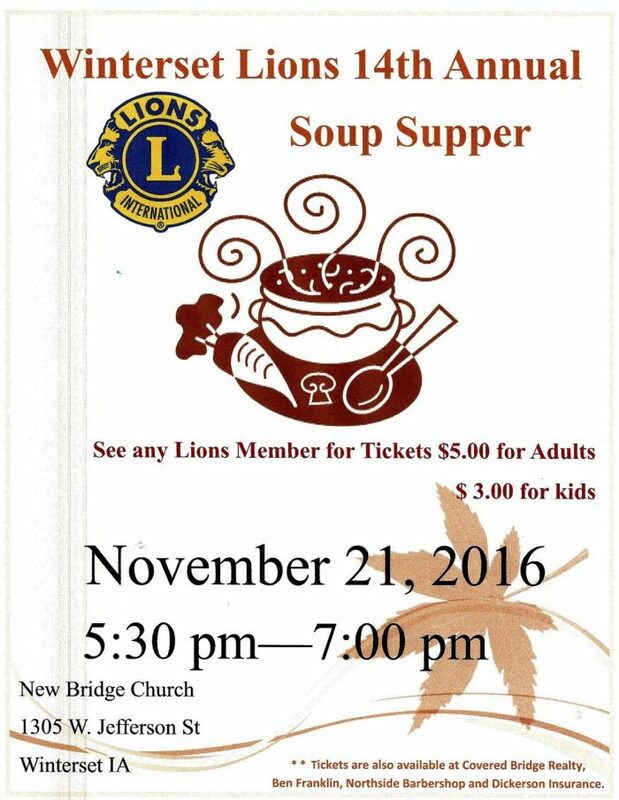 The Winterset Lions Club invites you to join them this coming Monday night for their 14th Annual Soup Supper, held at New Bridge Church, 1305 W. Jefferson from 5:30 to 7:00 pm. 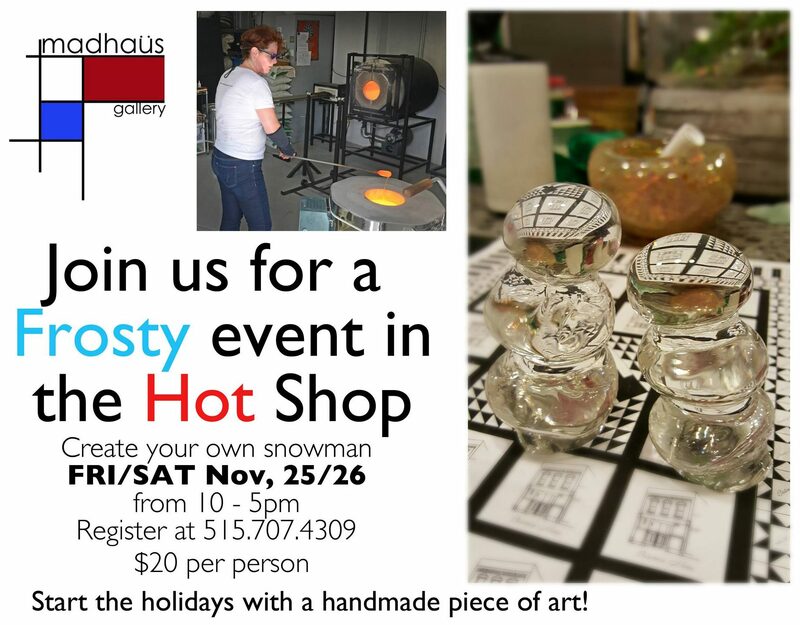 Madhaus Gallery is offering several great events and classes in the coming weeks and months, such as this Frosty Event in the Hot Shop on November 25th and 26th. Check their website for other opportunities coming soon! 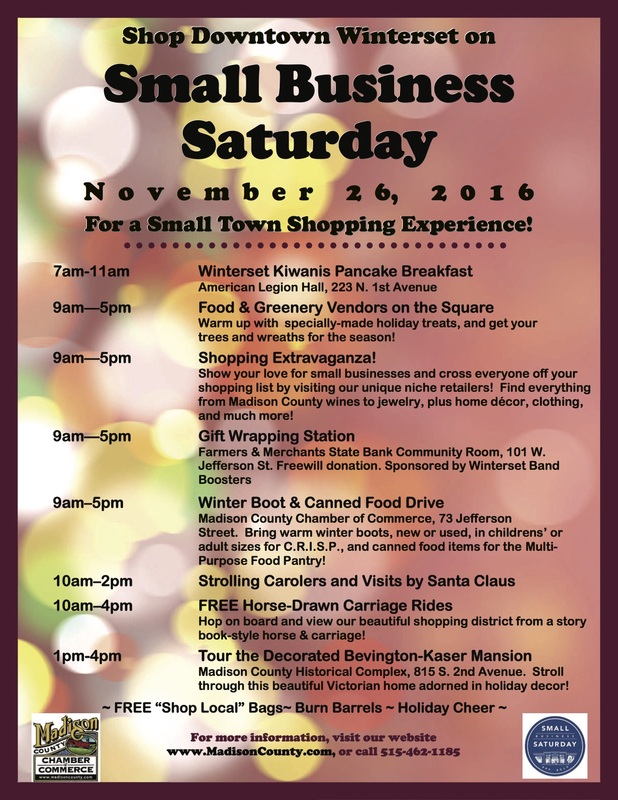 And the next day, Small Business Saturday in Winterset kicks off with a pancake breakfast at the American Legion Hall. 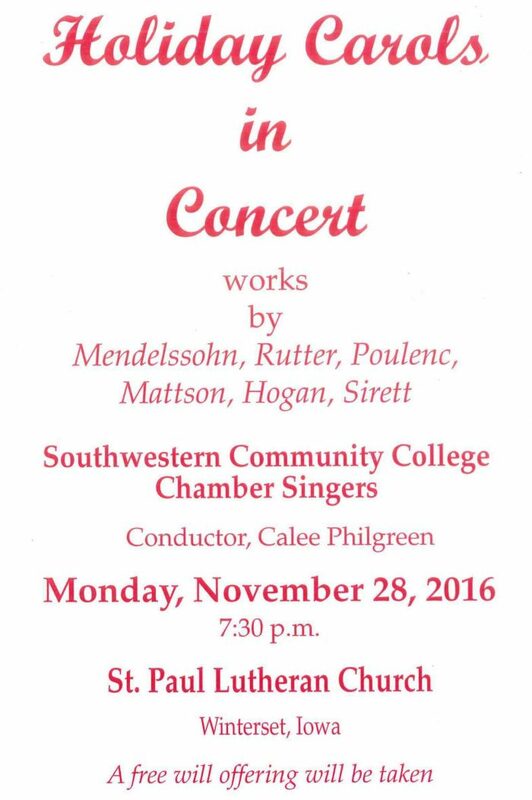 The community is invited to enjoy an evening of holiday carols performed by the Southwestern Community College Chamber Singers on Monday, November 28th at 7:30 pm at St. Paul Lutheran Church. Before I go, remember that the First United Methodist Church is offering a free Thanksgiving Day meal on Thursday, the 24th at noon. If coming to the church to eat is not an option, your meal can be delivered. Rides to the church are also available. Call the church office at 462-2912, or Phyllis Kaldenberg at 462-4731, for more information or to reserve your meal.